What have I done to myself? Sore legs and hints of hunger kept me tossing and turning all night. The first five days of training culminated in a long ride around the island. We’d dubbed the route the Ironman Plus, taking in most of the course with the added bonus of a trip over Femes and down to Playa Blanca. Lots of climbs and lots of headwind, but the final hour did the damage; feeling strong I put in hard efforts and surges, burning through any matches I had left. 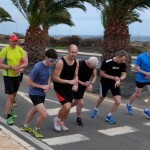 Two weeks in Lanzarote, my first proper training camp this year. I’ve left behind all distractions, internet access is limited as is the choice of TV; there isn’t much to do, but train. The island provides the perfect environment: the weather is good and climbs plentiful. It’s easy to work here. For the first time in months I’m training with Steven Lord, the partnership pushes me along, especially as I didn’t bring aerobars! The plan had always been to freshen up before arriving in Lanzarote. An easy week to recover from the long training block that preceded it. Last minute changes to my schedule ensured I delivered on that front and with my bike being serviced there was no opportunity to ride. Seven days passed with limited running and swimming and not one day in the saddle. From forty continuous days of riding to nothing. If I thought my Two Day Rule was good, then Seven Days is something else! My form (TSB) hit its highest since January. When it comes to my own training I tend to be ad hoc. Planning this trip I looked at last year’s diary and effectively duplicated it. No specific sessions or objectives; swim, bike and run as much as I could. It’s worked so far. In each sport I’ve been doing more than I normally would and probably more than I normally could. The motivation is there and I’ve pushed myself as I slowly stripped away that form I’d accumulated. I haven’t followed my imprecise plans. Last year I alternated between days of long, hard biking and easier ones often not riding at all. Bike training stress would either be through the roof or negligible; the gap was filled with a much higher run training stress. This year I’ve been consistent, the first four days each contained a three to four hour ride of moderate stress. Rather than exhausting myself on day one I’ve gradually pulled myself back into negative TSB. A gentler introduction to the island and the training it can deliver. Each ride was of good quality and the signs of building fatigue were initially subtle. Only after the much bigger effort in my legs have I really noticed the training. Just in time for an easier sixth day. I’ll give my legs a chance to recover. A steady swim, an easy ride and later an easy run. My Two Day Rule suggests I’d be best to take Monday easy too and I certainly won’t over do it. For this camp two five day blocks of hard training with a single recovery day between works well. It takes me to the Ironman when I’ll try a new kind of race day – one that still involves getting up early, but then spending my time at the side of the road cheering and encouraging those I know. I’ve two athletes racing here this year and I’m excited to see how they go. Cycling has been my focus for a few months, but I’m swimming and running regularly whilst I’m here. Each morning I swim two laps of the course at 7am; 3.8km of swimming every day. After six days my arms are starting to feel the effect – there’s a definite fatigue, but also an improving feel for the water. I’m taking steps back to my former self and perhaps with another month might feel like a swimmer again. I’ve left it late in the year, but finally picked things up. I’ve run on all but one day; short out and backs along the beach front with the usual emphasis on form. They feel fine and some pace is returning. At the same time I’m nervous about pushing further, the risk of more calf problems remains in the back of my mind. Reality is there’s not long till I next need to run a marathon, if I don’t run further in training it’s not going to be a pleasant prospect. A careful increase in volume is in order, nothing rushed and no expectations on pace. But today I’m enjoying the sun and a Spanish cappuccino as I write this blog. Tomorrow I’ll return to work. The week ahead will offer more of the same culminating with a day watching others suffer through an Ironman. I’m looking forward to not participating! It’s tough out there. As the race approaches I’ll try to upload some photos from round the island and put together my thoughts on how to race the Ironman. It’ll be a useful reminder for when I return to do the course justice.